Follow your passion, that’s the common theme found in successful businesses I’ve interviewed and Martha Stewart’s American Made Awards showcases talented, innovative, creative entrepreneurs who have that passion. I was happy to snag a few minutes with one of the awards finalists, Michelle O’Hollaren of Sophisticated Pup. Sophisticated Pup began when Michelle couldn’t find the kind or quality of items she was looking for her Pug Penny. With her Arts training, she whipped out the sewing machine and began the journey that took her to inclusion in celebrity swag bags and now the American Made Awards. 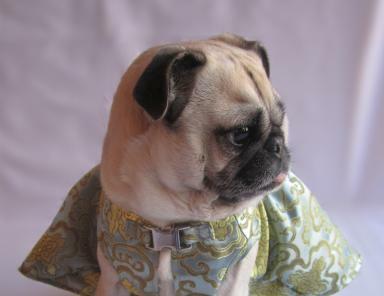 Sophisticated Pup apparel is now available in several EU countries, yet the company is community-minded supporting many local rescue fundraisers with their products. You will find a selection of handmade pet products from Sophisticated Pup when you click through to American Made Awards. It’s a family business, too – her dad crafts the handmade pet beds she features. The American Made Awards is an audience choice award. No one wins unless the audience votes, so go to Sophisticated Pup, click on the awards banner (you can’t miss it, it fills the front page), fill in your email address and vote! Easy! You can vote every day from each email address you have if you believe in beautifully crafted and designed American made goods =) The winner gets an article in the Martha Stewart magazine and $10,000. Enjoy the podcast and please Vote! This entry was posted in Mary Haight, Pet Products and tagged fine pet products, handmade, Martha Stewart awards on September 17, 2012 by Mary Haight. What stylish designs! Very cool! Awesome! Good luck! I voted and shared across my networks! Wonderful! I voted...what an adorable pic! Go Mary! Awesome Mary! That pug looks adorable!